Boys are rough on clothes. When they were little I would donate their clothes as they outgrew them. Sometimes they outgrew things before they hardly got to wear them. But as they get older, they were much more likely to wear their clothes out before they outgrew them. 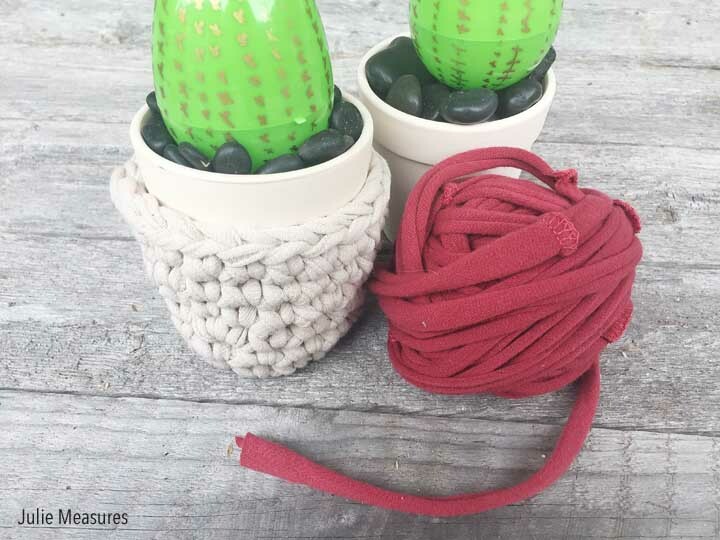 That’s when I realized that you can turn worn out t-shirts into continuous t-shirt yarn. 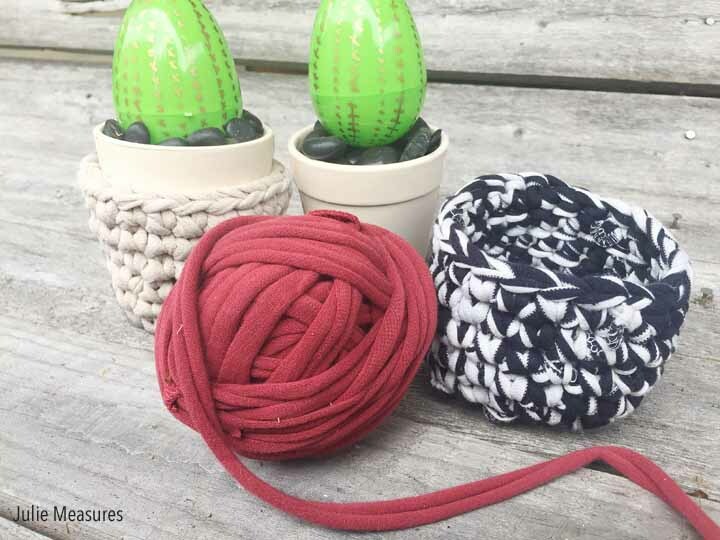 I still donate clothes that are in good condition, but things that have holes or are stained get turned into delicious t-shirt yarn. 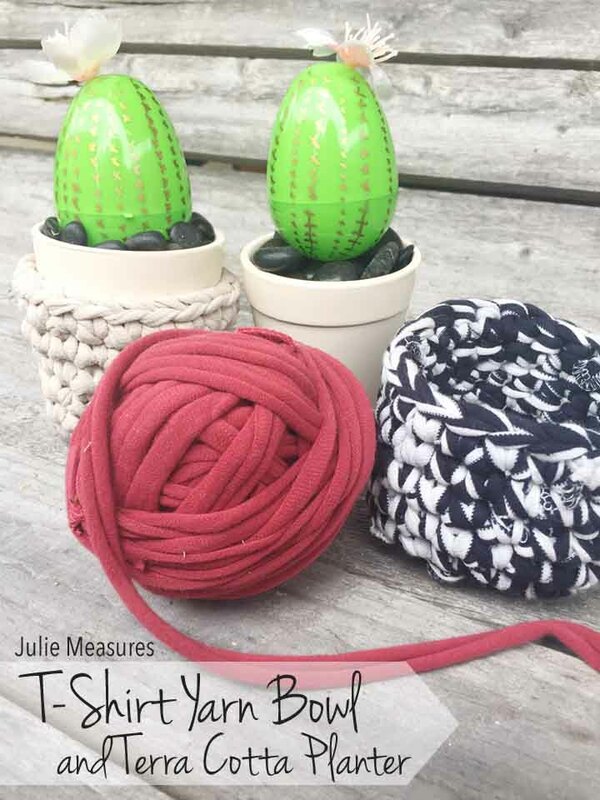 Take that soft worn out t-shirt and knit or crochet with it? Yes, please. And you don’t have to stick to solid color t-shirts. I love turning striped t-shirts or t-shirts with fun logos into t-shirt yarn. It makes the t-shirt yarn almost variegated with the different colors. I’ve been holding onto this light tan t-shirt yarn for quite awhile. I’m not sure why. I guess I was waiting for the right project. Littlest’s favorite color is green. For Easter his grandmother does color coded egg hunts. Each grandchild is assigned a color that they search for. Littlest always get to search for green. Which means, more than any other color, we end up with a lot of green plastic Easter eggs at our house. 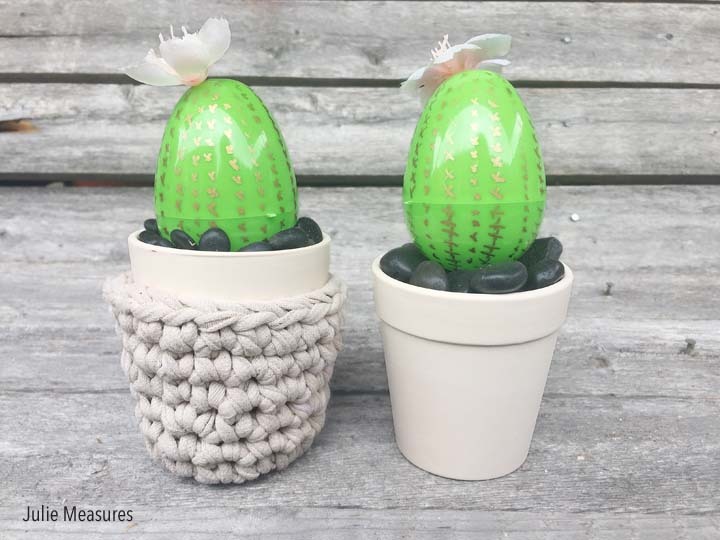 I realized that with a paint marker, some rocks, and a terra cotta pot I could turn that egg into a DIY succulent. I started by painting some needles onto my plastic egg with a paint marker. I choose a gold marker, but you could do silver, black, or white. Whatever looks good to you. Then I filled my small terra cotta pots with with river rocks. 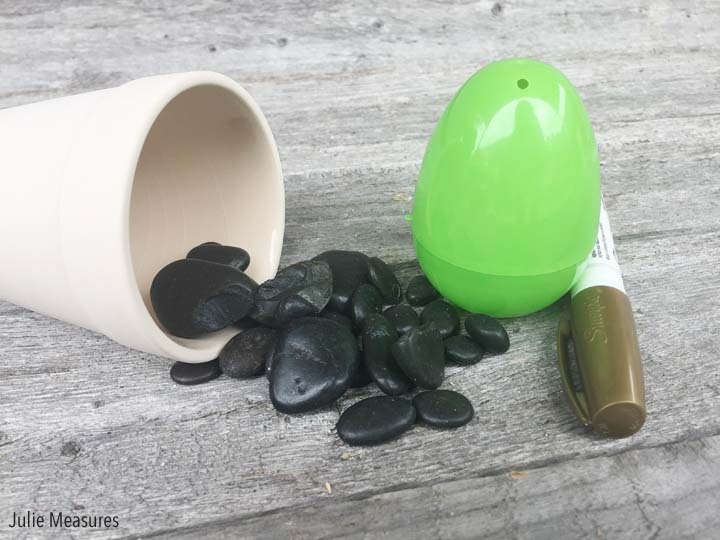 Nestle your plastic egg succulent into the rocks, and you might want to glue it down to keep it in place. I topped my succulents with some silk flower blossoms. I like my cactus to be in bloom. 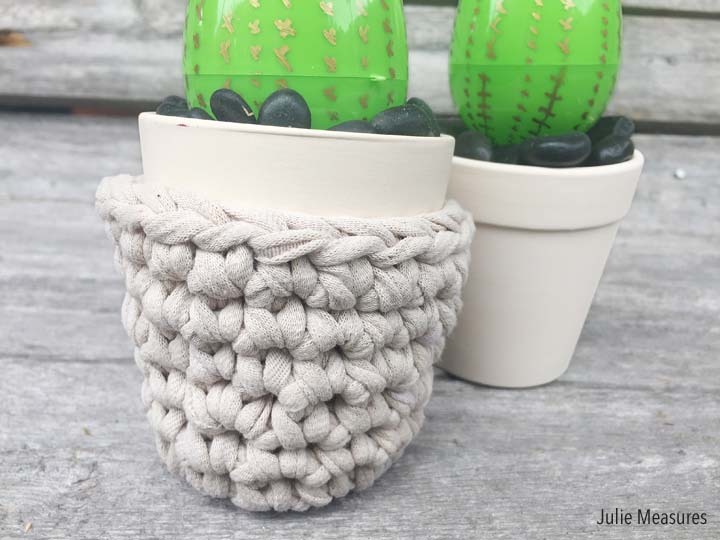 And that tan colored t-shirt yarn matches almost perfectly with the color of the planter and gives it a little extra warmth. 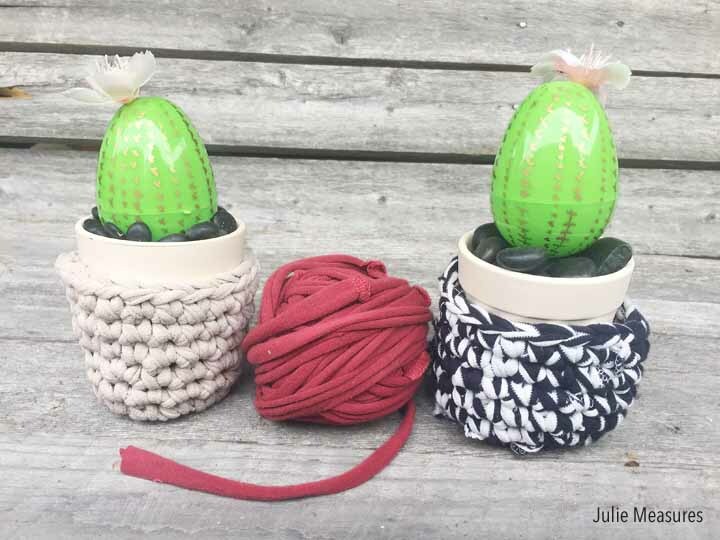 Of course the striped yarn bowl makes a great succulent pot cover as well. 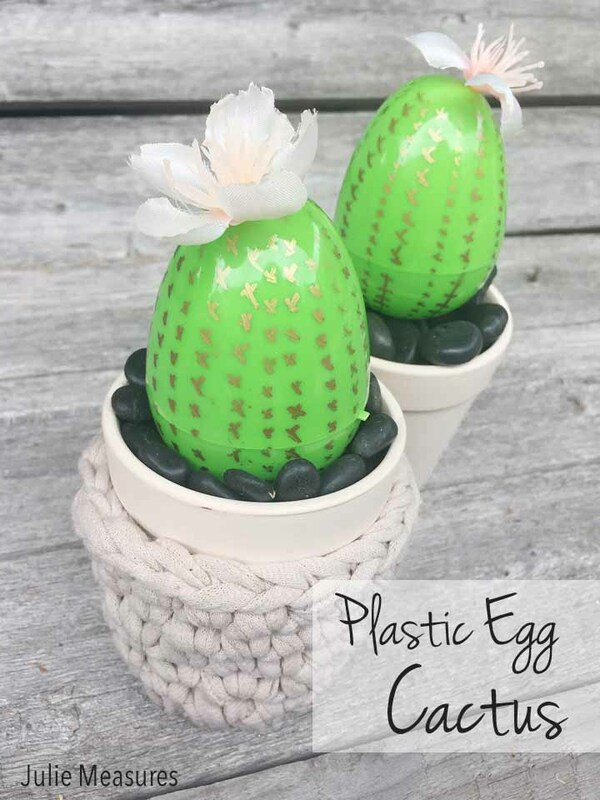 Plastic Easter eggs aren’t just for egg hunts!